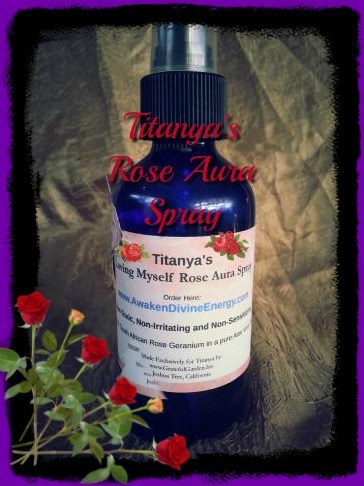 This rose / geranium blend is very healing for our hearts, as well as our aura. It is a loving mist! My aura mist will keep your energy cleansed from outside energies and in today’s world we need that. My Loving Yourself Aura Mist is very supportive to your heart and can be used in so many ways! It’s a great complement to any self-care routine you use. Titanya’s Tips: This sweet rose scent was created for the Rose Life Color, in general. When I began to spray it around myself, when feeling blue or my self- esteem was low, I found an exhilarating boost of self-love coming into my field. For those Romantic nights, spray your loved one in an intimate connection of love. Rose profoundly effects the emotions with the ability to both uplift and sedate. It reduces inflammation, is very helpful on bruising and reducing neuralgia (painful nerves). Spray over your heart for all heart issues – it is great to strengthen and clear the heart chakra. Geranium has a powerful effect on the emotions, it literally is one of the few oils, like rose, with the ability to both uplift and sedate. It has been used for centuries to treat acne, bruises, dermatitis, eczema, hemorrhoids, lice, ringworm, ulcers, edema, poor circulation, PMS, menopausal problems, stress, neuralgia, digestive ailments, kidney and bladder disorders.